Blog - Start Your Holiday Weekend With This Deal! Every summer there is a deal that you just can't ignore. This is that deal. 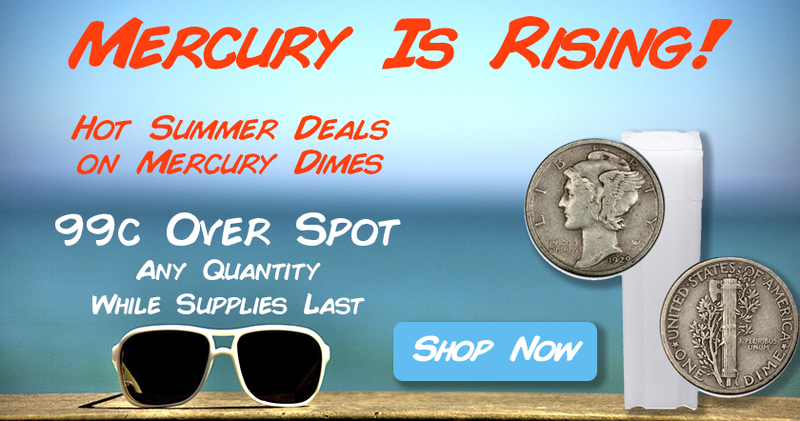 The Mercury is rising and Monument Metals is offering Mercury Dimes at only .99c over spot for any quantity while supplies last! Not only is Monument Metals the only major online retailer that will sell you 90% "junk" silver in $1 Face Value increments by type, we have the best deals on Mercury Dime tubes and Mercury Dime bags as well! Mercury Dimes have always been one of the most, if not the most, in demand denomination of 90% U.S. "junk" silver. Typically, these coins trade at a substantial premium over spot, and even a significant premium beyond their more common 90% counterparts such as Roosevelt Dimes or Washington Quarters. Mercury Dimes were produced from 1916-1947 and are considered one of the most beautiful coin designs in U.S. history. They much harder to find in quantity (and decent condition) than the Roosevelt Dimes that came later. Mercury Dimes, despite being priced like bullion, have true numismatic appeal. Having vanished from circulation over half a century ago, they've developed a tremendous collector following! This is a great way of owning a hybrid bullion/numismatic item. The precious metals market is quiet. Summer is here. For much of this year and into early summer, silver has been trading in the $16-$17 per ounce range. Summer is almost always a slow time in the precious metals industry. Most investors are paying more attention to the beach than their portfolios. Deals are to be had for the savvy investor/collector. Like all 90% silver coins, Mercury Dimes have a finite supply. When demand for silver heats up, these become extremely difficult to find. The result: premiums often increase dramatically. Two years ago, I remember trading these for $5.00-$6.00 per ounce wholesale! By contrast, we've been stockpiling Mercury Dimes at today's absurdly low premiums. This is why we can offer them to you for just over melt. Premiums are nearing all-time lows. Due to the factors mentioned above, premiums over spot for Mercury Dimes and many other silver products have fallen dramatically from their historic averages. This summer has created the perfect environment to save money on silver Mercury Dimes. These coins can regularly demand a premium of almost 40%-50% over spot and other online dealers haven't reduced their prices at all!